GALLE - Venations Ferarum, Auium, Piscium. . .
GALLE, J. - Venations Ferarum, Auium, Piscium. . .
Venations Ferarum, Auium, Piscium. . . - GALLE, J. Title : Venations Ferarum, Auium, Piscium. . ..
Map maker : GALLE, J.. Size : 7.9 x 10.2 inches. / 20.0 x 25.8 cm. 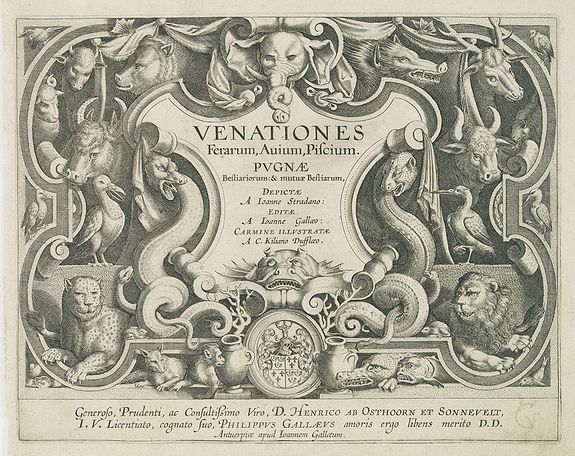 Description :Title page from "Venationes Ferarum, Avium, Piscium" or "Hunting Wild Beasts, Birds, Fish". The plate was engraved by Jan Collaert 1566-1628 published by Phillip Galle. The design was by Jan van der (Joannes Stradanus) Straet. Joannes Stradanus (1523 - 1605) first studied under his father and another painter in Bruges before joining Pieter Aertsen in Antwerp in 1537. He joined Antwerp's Guild of Saint Luke in 1545 and not long after traveled to Italy, stopping in Lyons, France along the way. Stradanus spent six months in Venice before settling in Florence to design tapestry cartoons for the Grand Duke Cosimo I de' Medici. He spent the years from 1550 to 1553 in Rome working on the Vatican's Belvedere gallery and then assisting Francesco Salviati. Upon his return to Florence, Stradanus began working for Giorgio Vasari and continued to design tapestries for the Palazzo Vecchio. His Flemish Mannerist style became infused with figures much like those of Vasari and Jacopo Tintoretto. Condition : Paper slightly age-toned. A good and dark impression.